A bioluminescent Chaetopterus in the lab. Photo: David Liittschwager. Researchers at Scripps Institution of Oceanography at the University of California San Diego have made a discovery with potential human health impact based on a study of parchment tubeworm, the marine invertebrate Chaetopterus sp., that resides in muddy coastal seafloors. A new study published today in Biochemical Journal finds that the tubeworm, also known for its bioluminescence, has a ferritin with the fastest catalytic performance ever described, nearly eight times faster than that of human capabilities. Ferritin, present in nearly all living organisms, is an important protein that manages iron metabolism in cells by storing and releasing it in a controlled manner. In humans, its function is critical to balance iron in the blood. 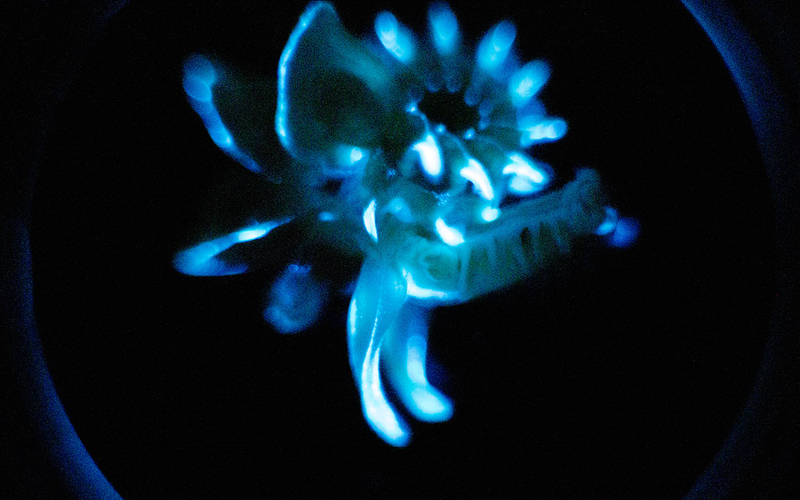 The parchment tubeworm has long been studied by Deheyn’s lab, primarily for its bioluminescent capabilities. The species also has the unique ability to keep its blue light glowing for hours, and sometimes days on end, significantly longer than most bioluminescent organisms that typically illuminate only for milliseconds or seconds. A study published in 2016 in Scientific Reports led by former Scripps postdoctoral researcher Renu Rawat suggested that ferritin in the worm’s mucus enabled the sustained light production. Because of the light-stimulating effect, the presence of ferritin in the tubeworm’s mucus was considered of interest by the researchers to further understand its role in this unusual light-production pattern. “The link to bioluminescence is incredibly important, and we’re just beginning to understand how ferritin influences bioluminescence and why ferritin works so much faster in this organism,” said Scripps postdoctoral scholar and study lead author Evelien De Meulenaere, who has been working with this tube worm’s unique properties for more than three years. De Meulenaere describes ferritin as being shaped like a soccer ball, with openings that take up iron when available, store it and release it when needed. That specific structure allows for a wide range in applications, from medical to environmental. It could help target medication release, function as a safe contrast agent, while also being used for water treatment by selectively taking up and storing contaminants. In her research, De Meulenaere tested two different approaches to measure enzyme response, covering different time scales. Both approaches compared the reactions of worm ferritin with human ferritin. In the first approach, iron was added to reaction tubes containing the respective ferritins, after which the remaining amount of ferrous iron left in solution was measured over time (1-2 hours). The second approach analyzed on the millisecond time scale how much iron oxide was created inside the ferritin, indicated by the generation of “rust” coloration in the tube. Both approaches determined the worm ferritin converted iron significantly faster than the human version. The tubeworm is pervasive in nearshore, muddy seafloors. The species used in this study is common throughout San Diego and Southern California; however, different variations of the tubeworm can be found in temperate coastal areas around the world. Considered an invasive species that typically lives in a tube that it builds in the mud, the worm and its tube encasement are also being studied by researchers in Deheyn’s Lab to further analyze its resilience to heat.